This post explains how to get a Massachusetts real estate license this September. The Massachusetts division of professional licensure mandates a 40-hour education requirement. Most Massachusetts real estate schools break the 40 hours in to four 10-hour sessions, usually back to back weekends or two Tuesday/Wednesdays in a row. Find a real estate school with good reviews that offers the course either in a physical classroom or live online. 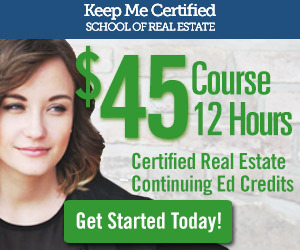 Keep Me Certified offers classes live online every month, so you can complete the full 40-hours from the comfort of your own home or office. Our next real estate salesperson pre-licensure class starts September 9, 2017. Upon completing the full 40-hour class, candidates will receive a candidate handbook which contains instructions to schedule the exam. Exams are offered at approved testing centers across the Commonwealth of Massachusetts. Have questions about the class or process? Visit us at keepmecertified.com, live-chat, email or call us 7 days a week.